2013 is shaping as an incredible, spectacular year for us. We are incredibly happy, humbled, honoured to share with you our recent accomplishments. We would like to thank each and every single person who voted and supported our recent nomination to win the “Best New Cinematographer” Worldwide award in the Wedding Industry Experts 2013 Awards. We have been overwhelmed by your messages of support and the shear number of votes and awards we have received! To us, these awards aren’t just merely trophies or pieces of paper… they are a testament to what we believe in, and what we continue to strive for – Excellence in wedding cinematography, emotionally-driven storytelling and our undying passion for our craft. Your wedding day and capturing it in an amazing wedding video is always our goal. We know there are many great and wonderful wedding videographers out there who deserve the same. We are inspired by many of them, not only by their works but also through their continuous help, advice, support and praise, we continue to improve our craft in wedding filmmaking and continuously raise our standards. 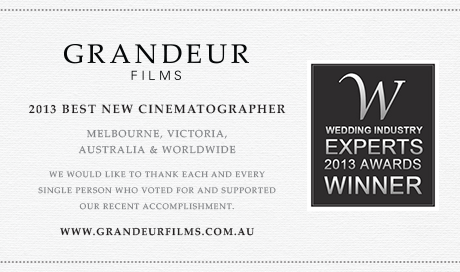 The wedding video industry is teeming with talent, and we’re humbled to have received the award for the best new cinematographer of 2013, not only in Melbourne, Victoria, Australia but also Worldwide. We are overwhelmed. To be featured with “The Knot” a few weeks ago as a trustworthy and creative wedding cinema studio is an honour in and of itself. But to be voted in by our own clients and brides we don’t know from all over the country and worldwide is an even bigger honour! We are so excited to be represented as Melbourne’s best new wedding videographer and we will use this accolade as a mission statement to continue to evolve wedding videos for our deserving brides and grooms. A big thank you to all of our AMAZING brides and grooms – past, present and future, who have been there to support, love and believe. You believe in us, and it’s our responsibility to live up to the honor you voted us into. Thank you to everyone who continue to follow our journey through our blog, Facebook, Google+, Vimeo, etc. and to everyone who continue to support us. A HUGE thank you to our clients, for seeing something different and unique about our work, and for allowing us to do what we LOVE to do. Grandeur Films – Internationally acclaimed multi-award winning wedding video filmmakers based in Melbourne, Australia. Wedding videographers specialising in Same Day Edit video. We have our brand new fan page up on Facebook @ Grandeur Films. And we really have been working hard to build our community by offering great fresh content each and every week. And we would like to invite you over to be a part of our Grandeur community and ‘Like’ our Facebook Page. It is greatly appreciated! Thank you!